Each year, St. Andrew’s Episcopal School, like all independent schools, relies upon the collective support of parents, alumni grandparents, former parents, friends, foundations, board members, faculty and staff to cover the full expenses of school operations. Through the Annual Giving program, supporters help St. Andrew’s change students’ lives with a rich curriculum and a strong community. The St. Andrew’s Annual Giving program provides unrestricted, current operating support for the school’s budget, making up the shortfall between tuition and other income and the operating budget.But it’s not just a matter of paying the bills – Annual Giving dollars make it possible to attract a bright and motivated student body, recruit outstanding faculty, offer a comprehensive curriculum, and maintain the beauty of our campus. Annual Giving plays an integral role at St. Andrew’s by providing immediate funding for day-to-day needs. In addition to being tax deductible, Annual Giving donations may qualify for employer-sponsored matching gift programs that can double, or even triple, the value of your gift. 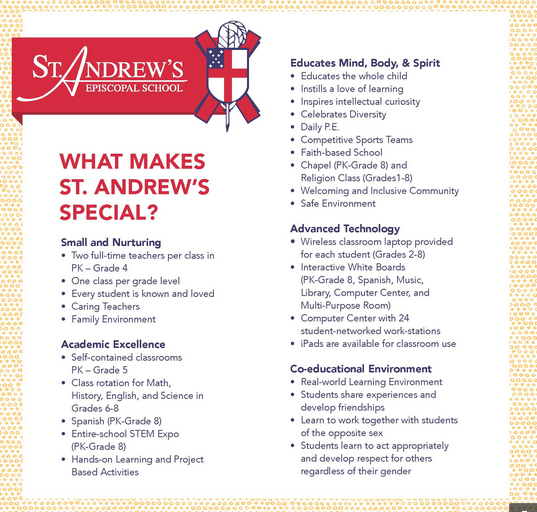 For additional information on how you can contribute to St. Andrew’s Annual Giving program, please contact Dominique Chauvin, Director of Development at dchauvin@standrewsepiscopalschool.org or (504) 866-6552. Additionally, you can contribute by requesting the Annual Giving response form or by making a gift electronically to St. Andrew’s Episcopal School through our quick, easy and secure on-line giving. Your information is safely submitted to the Development Office of St. Andrew’s.